Touristic tours to the historical highlights of Palermo and Monreale, only 35 km away, can be organised with our own English speaking guide (art historian) and private transportation on a bus for up to 18 people. 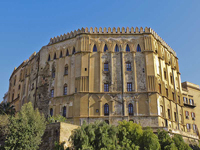 We have designed six routes to explore Palermo in different periods (Arab-Norman, Baroque, Liberty), to visits its aristocratic Palaces, the Byzantine Cathedral of Monreale and the 10th century Castle of Trabia built on the sea rocks. 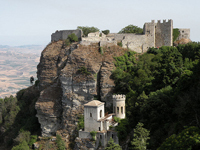 We also include private bus transportation and official touristic guides for the whole Sicily. Our guides are English, French and Russian speaking and have long experience in working with foreign groups. We offer bilingual translators for Japanese, German and Chinese, also available to stay full time at the villa and to travel with the tourists. 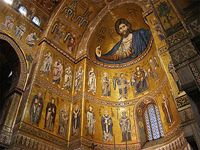 The UNESCO cultural site (July 2015) denominated Arab-Norman Palermo and the cathedral churches of Cefalù and Monreale is within 40 min reach from Trabia. It is a collection of monuments with mosaics, paintings and sculptures created during the Norman period (1071-1194). The socio-cultural mixture that characterised Sicily in this period gave birth to an extraordinary artistic and architectural heritage of outstanding value. Eighth other inscribed UNESCO cultural and natural sites in Sicily are within 1h 30min - 2h 30min reach. A splendid medieval small town founded by Phoenicians on top of a mount with spectacular sea view. One of the most impressive archaeological sites in the Mediterranean. UNESCO cultural site. The most spectacular archeological place in the Mediterranean. sea with 12th century Norman Cathedral. significance for scientific, cultural importance and educational value. The most important city of Magna Grecia. Greek theatre, vast archaeological site and museum. Wonderful Greek theatre overlooking the Etna volcano. UNESCO cultural site. near Syracuse. Necropolis between 13th and 8th BC. outstanding testimony to the exuberant genius of late Baroque art and architecture.